Hello and welcome! This website is the landing page for Logbook, and provides some essential information about the website and what it does. If you already know what Logbook is about or just want to jump straight in, click the button above to get started! Logbook is a website which can be used to keep notes about projects that you are working on. It features a simple interface which lets you write entries on a day-by-day basis, locking the main content of a page once the day is over. Logbook manages timestamps for you - placing them in the margin alongside the text that you write. 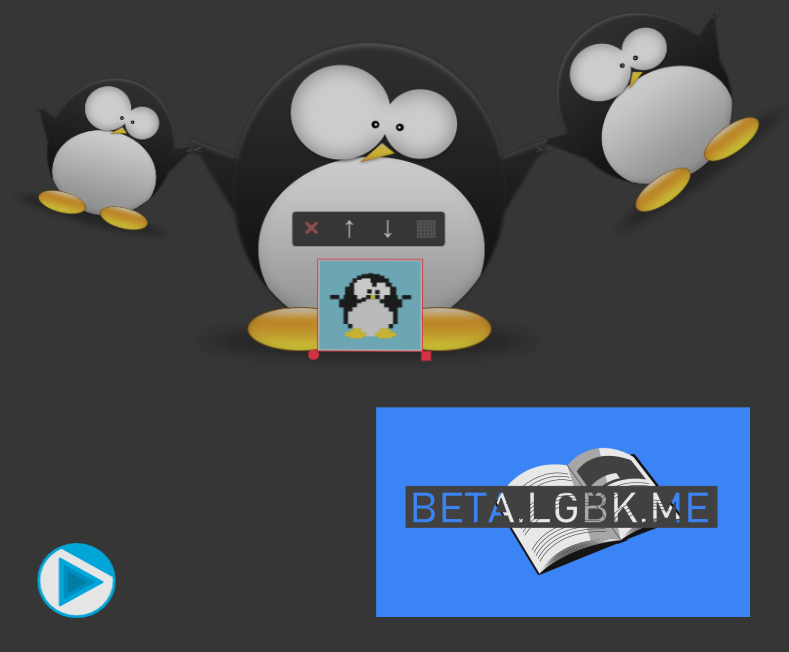 You can add images, tags and comments, code snippets and even formulae. You can draw on top of all of these using a simple set of drawing tools. Logbook has a wide range of free features. However, for the best Logbook experience, try our Premium plan with no ads, unlimited storage, and enhanced features such as a powerful search tool, reminders, page starring, exporting and more! Our hope is that Logbook will provide you with a way of taking consistent notes as you work on projects, whilst streamlining the note taking process and removing the need for carrying a log book around with you, or ending up with notes scattered all over the place! Right now Logbook is changing and improving frequently, and we try to act on feedback from our community as much as possible, so if you have any ideas or suggestions please get in touch with us! If you're currently browsing on a mobile device you may find that whilst Logbook works the format doesn't suit small screen devices, our hope is to develop a native application for mobile devices in the future, but at this moment in time Logbook is only optimised for desktop use. Thanks for reading, and for checking out Logbook! Multiple drawing tools are available that make the drawing experience as seamless as possible. If you're a more visual person and like to hash out drawings on the go, then this feature is for you! This screenshot also highlights how tags can be used to discuss elements of your notes after you have made them. Tags are a powerful way of adding context to components, by simply placing a tag on top of a component it becomes linked to it, and will return it in search results and if a reminder is set on the tag. This page background has been set to dark mode, which can be a bit easier on the eyes for some users! Images can be placed anywhere on the page by dragging and dropping from folders on your computer or directly from other websites! These images can then be resized, repositioned and rotated at will. With layering options and the ability to lock images to a grid when repositioning. If you want to talk about your concept art progress or refer to your engineering drawings you can use this feature to display your images alongside your notes. The tool bar provides access to all of the main tools that are available in Logbook. 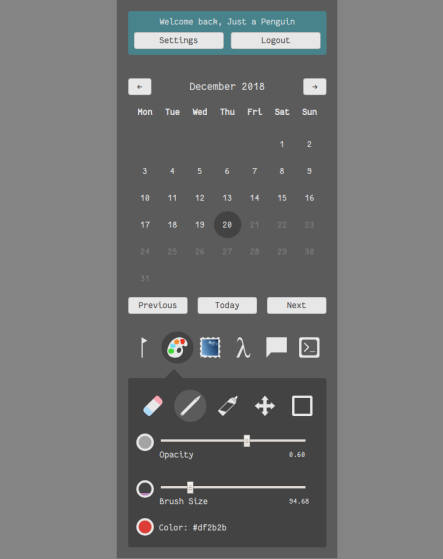 Here you can access user settings, navigate to different days, switch between modes (text, image, drawing, formula, tag and code) and change advanced tool options such as your drawing tool, brush size, opacity and colour whilst drawing. All of the functions of the toolbar can be accessed via keyboard shortcuts, and switching between modes can also be accomplished simply by ctrl + clicking on an existing page element corresponding to the desired tool. 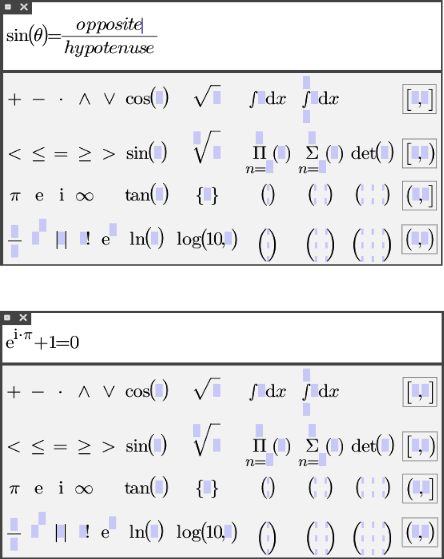 The comprehensive Formula Editor allows for quick and simple rendering of complex mathematical formulae, complete with syntax checking! 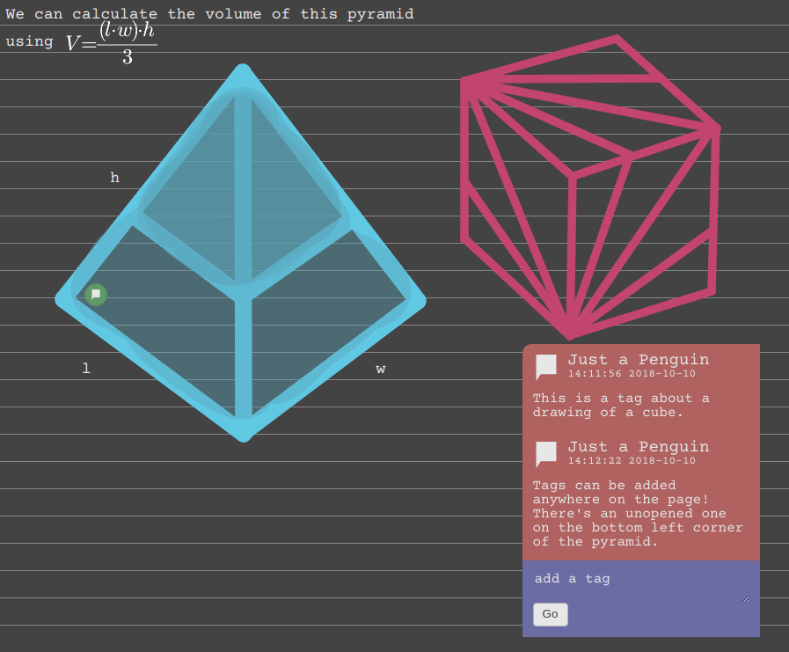 If you're likely to be working with equations this tool will enable you to easily format them alongside your notes. 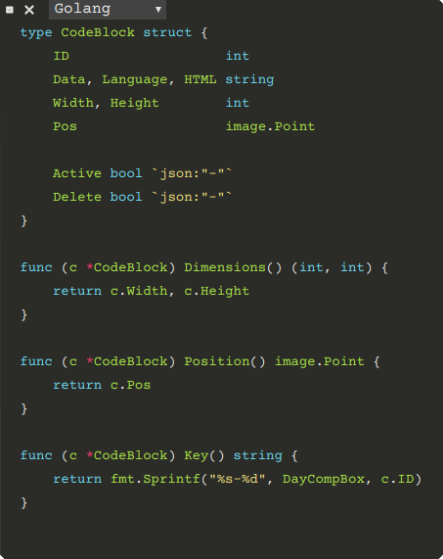 Code blocks provide a powerful syntax highlighting tool with support for multiple languages, and can be created and placed dynamically on the page. 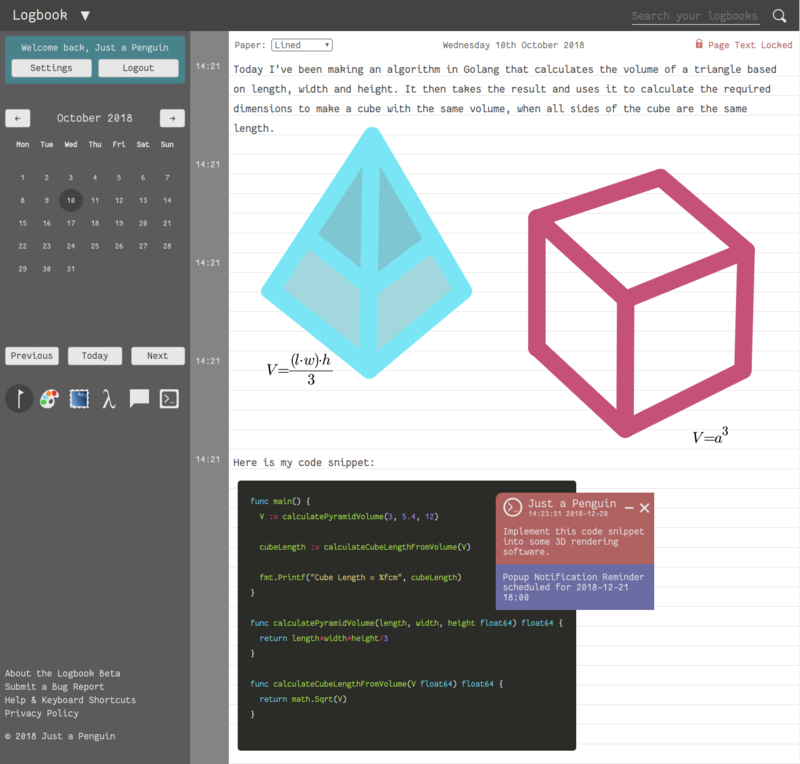 If you're a full time programmer or a hobbyist developer this tool will allow you to show examples of important sections of code in your notes, or to quickly jot down some ideas on the go. A powerful search tool is available that can be used to quickly find important bits of information in your Logbooks. Any component that includes text is included in the search index. Although you can search for images and drawings too by searching for the text content of a linked tag, the result will return both the tag and the linked component! Tags can be used to set reminders, which can take the form of notification popups in your browser or emails sent to your registered email address. Reminders can be set up to a year from the current time! Just like when searching, if a Tag has a linked component then the reminder will show a preview of the linked component (only for popup reminders). If you want to open the page that the reminder was created on you can do so by clicking the included link.